A young massive star that began life around 25 times more massive than our own Sun is shedding shells of material and fast winds to create this dynamic scene captured by ESA’s XMM-Newton. The image shows the detailed structure of the Crescent Nebula that shed a shell of material as it expanded into a red giant some 200 000 years ago. Fast winds emitted more recently have now collided with that material, causing the gasses in the bubble to heat up and emit X-rays, seen as blue in the image. Other features can also be seen, such as the green hue, generated by oxygen atoms, where the star’s wind is interacting with the surrounding interstellar medium. Density differences in the surrounding material may give rise to the different structures, such as the extended bubble segment to the top right. The star will likely end its life in a violent supernova explosion. The Crescent Nebula sits in the constellation of Cygnus about 5000 light-years away, exactly at a location in the sky that has not been accessible to XMM-Newton until recently. Although it has been well studied by other X-ray telescopes, astronomers working on XMM-Newton, which was launched on 10 December 1999, had to wait patiently until the orbit of the satellite was such that this patch of sky moved into its field of view in April 2014. 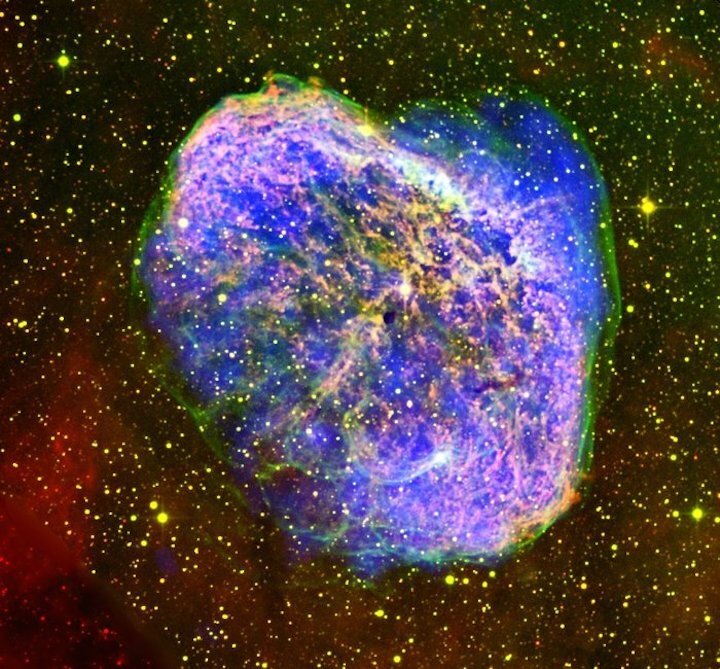 More information about XMM-Newton’s observation is available in “X-ray emission from the Wolf-Rayet bubble NGC 688. II. XMM-Newton EPIC observations,” by J. Toalá et al. (2016).